Every girl needs 1 or 15 different Classic White Button-Downs!!! Truth. They are a classic and an essential item to have. Whether you borrow one from your guy for a more relaxed vibe, leave it slightly untucked with blue jeans. Tucked into a pencil skirt for the office. They really are a piece that can take you everywhere!!! I have 3 long-sleeve button downs of various styles, a short sleeve and then a handful more classic plain white tops. They are my go-to!!! And best part so easy to wear!!!! Silk, or cotton - Woman's or mens - tank, short-sleeve, or long-sleeve - they are all great!!! Pair them with any style jean, colored/patterned/floral. Toss on a fab pair of earrings, or simple flats, or a knock out pair of heels. You will feel great and look like a million bucks! How do you wear your White Button Downs? I totally agree (and believe or not, I am wearing a white button down shirt right now!). I think it is such an important piece for every woman to have. I mostly have cotton, but I kind of want a silk one, particularly the JCrew one in your collage. We are all on the same wavelength! Maybe because it's the feeling of sunshine and the smell of spring, but a crisp white shirt has been on my mind lately. I definitely need to replace the one in my closet. It appears to be fine but when held up against some other new white pieces, it looks dingy to me. And nothing is worse than a DINGY white shirt. I love your picks and may need to clickity click over and get one! Classic staple in my closet. I buy them in pairs. French cuff, mandarin collar, safari pockets....can't get enough of my CWS...classic white shirt! Now following you. Please visit my blog and follow back if you like! Nothing more classic than a white button down! Love your picks! So agree with this. Such an easy piece with pair with everything! I have a cream one from LOFT that I love. And those BaubleBar earrings are great! I love this post. I could wear this look everyday. I'm dying for a pair of florals, but they're so trendy I don't want to break the bank. Any suggestions? Couldn't agree more, invest in a white silk Equipment blouse and you'll get your money out of it in no time! I started with a white one and now have a small collection of three - they're just that good! Awesome post! 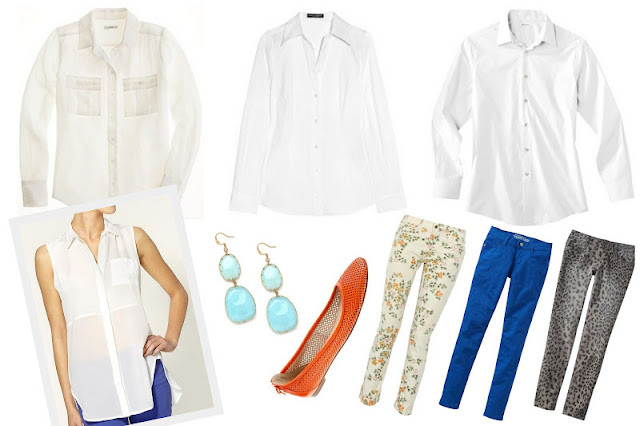 I'm a huge fan of white button downs - some of my favorites are boyfriend style from H&M ($12 each! ), silk from Equipment and plain old regular from BR & Ralph Lauren. They're great year round and always look classy. This is such a staple in my closet. I have a wide range of styles... The great thing is you can find a lot of very affordable white button downs that look great on! I still haven't found a white button down shirt that fits and is within my price range. Booo but I love the blouse in inspiration #2! I love how many ways there are to style basic white button-downs. Brilliant. Those floral jeans are amazing! Those flat shoes & jeans are so wonderful.